...I think the kind of film Tarantino makes is original (waits for Jimmy to argue ) maybe not story wise but technique wise, unfortunately his technique is getting old, can he ever really out do himself? I get what you mean, Emma, as this will always be a Marmite film, just like his others, but it's how fresh the technique was for Basterds that made me love it. The opening scene and the restaurant were both sublime at least and then the finale... I said in my review one shot in particular from the final moments feels like it will be a classic moment for me. Loved it, loved it, loved it! I know what you mean about "one shot" making the movie. I had this with Titanic, while still a James Cameron film in overall, often rightly accused of being too sappy. When the boat is sinking (oops, spoiler ) there is a brief moment of a series of, I believe, three static shots, showing how different people cope with the fact that "this is it". There's the designer/engineer/owner who stands in the lounge setting is watch, there is the captain standing in his "cabin", with the water rushing in and finally an old couple who simply hold each other in bed waiting for the inevitable. Those three shots made that film for me. Plot: When wealthy industrialist Tony Stark is forced to build an armored suit after a life-threatening incident, he ultimately decides to use its technology to fight against evil. My Thoughts: Iron Man is a film that does have its faults, yet not enough to cloud how enjoyable it is. This is about the third time I have watched this film and I have thoroughly enjoyed all of my viewings. I think the casting was perfect and Downey Jr as well as Paltrow are two stand-out’s for me. I must admit that before watching this film I had seen hardly anything else of the Iron Man franchise, perhaps a cartoon here or there but I never really paid attention to him as a superhero. This film however defiantly put Tony Stark on the radar for me and I am highly anticipating the sequel this year. I found the action scenes in this film to be quite standard, the visual effects were indeed impressive but the fight scenes themselves felt like they were lacking some originality. In the film however it is not the fights or action which is what made me enjoy it so much, and indeed I am glad that the film isn’t just one mindless fight scene after another like some other blockbuster actions can be. I found that the scenes dealing with Tony’s problems within his company, as well as building and developing the suit to be more compelling than any other in the film. I think the attention to detail is also important in this film, such as the little things like making a robot arm in Stark’s basement a humorous character throughout the film. In the end this is a film that I have already enjoyed many times and I can see myself enjoying many more times in the future. Plot: Two women get into a lot of trouble when they go to their high school reunion and lie about their lives after twelfth grade. My Thoughts: First off, I don’t have this movie on DVD. I was just flicking around TV today and it was about to start, since I have never seen the whole film before I thought I’d give it a go. Romy and Michele’s is a perfect example of what I consider harmless entertainment. It’s a simple, and somewhat predictable story that is delivered with a lot of fun. You cannot take this film seriously, in this case however it was never meant to be taken seriously and that fits it perfectly. While not being one of the funnier films I have seen I still had a couple of laugh with these two friends quest to prove that they invented post-it notes. I felt the film was quite slow at the start in L.A but quite enjoyed the scenes at the actual reunion. While I can’t see myself watching this one again and again, it was a nice lightly entertaining film for the afternoon. Plot: An uncommonly gentle young man, who happens to have scissors for hands, falls in love with a beautiful teenage girl. My Thoughts: Edward Scissorhands is definitely one of my favourite Burton films, yet one I have actually not seen very often. Last night I watched it for maybe the second or third time. Needless to say, this film still has a huge impact on me when I watch it, Scissorhands is hauntingly beautiful and ironic from beginning to end, with such bizarre characters and visuals I am actually surprised at myself for not watching it more. The stark contrast in the film between the dark, dreary gothic mansion in which Edward lives and the overly colourful suburban town surrounding it is outstanding. There is nothing at all subtle about the contrast between the two, which is something that Burton likes to point out many times in the film when he quickly cuts from one to the other. Edward’s home does indeed appear to be drowning in these terrible pastel colours, creating another world within a world. The idea of an Avon lady meeting a reclusive man with scissors for hands in an old rundown mansion and bringing him home is so bizarre that it sounds like the plot to some terrible B movie, yet Burton brings his tale to fantastic life in one of his most unique stories to date. Danny Elfmans score for this film is simple breathtaking and bring such a strong sense of emotion to some scenes in a way that makes them truly memorable. More than anything I love the way Burton is able to completely turn things on their head. His parody of a cozy and safe little American suburb is soon exposed to being harsh and cruel, while the large and downtrodden gothic mansion which feels like the set to a horror film at the start, soon becomes somewhat of a safe haven. The design aspects of the film are amazing, especially within ‘The Inventors’ strange mechanics. Each of his robotic friends has a distinctive Burton look to them, a look I have seen many times in books of illustrations from Burton’s childhood. Overall this is a fantastic film that I consider at times, eerily beautiful and one that I am very pleased to have in my collection. Great review! I think it may actually be Tim Burton's most personal film, especially as you hit the nail on the head of the suburb being cruel and the Gothic mansion a haven. I hadn't really thought about that. Thanks Jon. It may very well be his most personal film. I love Tim Burton films but like most I have noticed his decline from these unique and original masterpieces into bizaare high budjet remakes such as Charlie and the Chocolate Factory. While I do enjoy those remakes I do wait with baited breath for the day that he will once again make an original film such as Beetlejuice or Edward Scisshorhands. Plot: A Las Vegas-set comedy centered around three groomsmen who lose their about-to-be-wed buddy during their drunken misadventures, then must retrace their steps in order to find him. My Thoughts: This was a highly entertaining and hilarious film, the quite bizarre and outlandish situations that these men are thrown into provide quite a journey from start to finish. While I enjoyed this film and laughed quite a bit I can’t see it as being one I would choose to watch myself time and time again, I can definitely see it however as being a fantastic ‘after party’ film with friends, a spot usually filled with the likes of Anchorman or Knocked Up. The performances were fantastic and the addition of a baby and a tiger was genius, I also enjoyed the circular narrative and think it fit the film well. A highly enjoyable film. Plot: The Dark Knight of Gotham City begins his war on crime with his first major enemy being the clownishly homicidal Joker. My Thoughts: I grew up watching Burton’s Batman films and they are still some of my favourites. As far as Gotham city goes I have always preferred Burtons to Nolan’s, that’s not to say that I don’t like Nolan’s films though because I do, I just feel his Gotham is lacking the creativity within Burton’s work. There are so many fantastic and memorable moments in this film, most of them of course, thanks to Jack Nicholson’s wonderful Joker, including that memorable mirror scene which The Simpsons parodied so well. Nicholson’s Joker creates a fantastic amount of chaos in this film, and some scenes such as his henchmen all dressed as mines, slowly creeping up on the people are quite creepy, in fact a lot of the joker scenes have an eerie air to them. As I said before, the visuals in this film are perfect, especially within the city itself. Gotham here isn’t realistic, instead is a gritty fantasy which is what I believe it should be. The Jokers face was brilliant in this, and even more creepy when seen on many of his victims throughout the film, and that classic makeup and purple suit created such a fantastic image. This will always be one of my favourite Batman films. Plot: A civilian diving team are enlisted to search for a lost nuclear submarine and face danger while encountering an alien aquatic species. I watched this film for the first time today, and I should begin with saying that I usually can’t stand films that are mostly underwater which this is. Or indeed, films about sinking/ flooding ships with people inside, it makes me feel claustrophobic to watch such scenes which is one of the main reasons I don’t like Titanic. 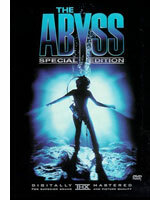 The Abyss however had a sci-fi element to it which kept me interested for the most part. I love films where aliens aren’t the bad guys which is probably why I was so drawn to this film, one of my only complaints being that I felt not enough time was spent on the actual sci-fi side of the film. I loved the second half of this film, although I felt the first dragged on a little bit as too much time was spent in an almost conventional Poseidon adventure-style series of action or ‘sinking’ scenes. Any scene with the alien beings I found captivating and I loved their design, basically they were the only beautiful things in the film, and the visual effects were stunning I believe for these late 80’s periods. One thing I did notice in the film was that the aliens and the message they harbored was similar to The Day The Earth Stood Still, we seem to think that we need aliens to tell us that humans are too violent. I highly enjoyed watching this film, but I felt I would have enjoyed it more if there had been more of a focus on the science fiction elements rather than just the crew ship and their problems. I would probably give it a 4, or 4.5 for how much I enjoyed the alien aspect of it. Hmmm, interesting, I always thought the second half was the weaker part of the film. Haha, well everyone does view films differently. Plot: A young naive woman falls for a handsome young man who her emotionally abusive father suspects is a fortune hunter. I first came upon this film last year while I was studying Henry James’ Washington Square in my high school literature class. While I admit that I didn’t overly love the novel it was still an interesting text, although one which I probably won’t be reading again soon. While we were studying it we also looked at this film adaption by William Wyler and I loved it so much that I bought it for myself on DVD. Olivia de Havilland portrays Catherine Sloper perfectly as the shy young girl overshadowed by her father who does not really excel in any fields (except for stitching that is). The audience is positioned to sympathize with Catherine as the two leading men of the film appear to somewhat control her life without her permission. First we have Morris Townsend, a handsome young man whom Catherine falls for when she believes that he is generally interested in her, and then we have her father, Dr Sloper, who’s cruel irony see’s nothing but a man after his daughters money. Something I liked about the film, and indeed the novel is that it’s hard to ever really stay angry at any of these characters for long as they don’t always end up who they appear to be. On one hand, Dr Sloper seems rather cruel when it comes to his daughter, yet on the other hand he is only trying to protect her in her own interests. Townsend also has a similar situation to this, is he the nice, carefree young man that he appears to be? In the end the thing I love most about this film is Catherine Slopers journey, indeed she is a very different person at the end of the film, than she is at the beginning, and these radical changes are definitely a product of those who surround her. Cast: Johnny Depp, Helena Bonham Carter, Freddie Highmore, David Kelly, Noah Taylor, Deep Roy, Christopher Lee, Adam Godly, Anna Sophia Robb. Plot: A young boy wins a tour through the most magnificent chocolate factory in the world, led by the world's most unusual candy maker. I have always felt this to be a great book adaption, it is by no means a perfect film but it is highly entertaining and unlike the previous remake of Roald Dahl’s story, this one actually sticks quite close to the source material. As I have probably mentioned many times before on this site, I am a massive fan of Roald Dahl’s novels, I grew up reading them over and over as a child and still enjoy reading them today. Perhaps it is because of this that I never liked the 1971 Willy Wonka and the Chocolate Factory. That film for me never really captured the spirit of Dahl’s work, it was scary, sometimes disturbing (the scene with the fans) and I did not like Gene Wilder’s portrayal of Willy Wonka. In the novels, Willy Wonka is a highly eccentric shut-in who has for many years lost touch with the world outside of his factory, and therefore become quite anti-social and unsure around other human company. I think that Johnny Depp captured this role much more accurately than Gene Wilder’s portrayal. In some scenes Gene Wilder seemed almost fatherly to me which is not what Dahl ever intended of the character. As far as staying true to the book goes, Burton does pretty well, the adventures in the chocolate factory are dead on, the songs lyrics are words taken directly from the novel itself, and some scenes are set up exactly the same as Quentin Blake’s original illustrations from the books. The only major differences are the ending, which is changed slightly and also an added background to Willy Wonka himself which explores him as a child. I thought this background of Wonka was interesting, but probably not totally needed, the flashbacks were definitely not my favourite part of this film. Neither film adaption so far has quite got the Oompa Loompa’s right to me. The 70’s versions orange skinned little people were just creepy, and Burton’s use of Deep Roy as every Oompa Loompa didn’t quite seem to fit either. Overall though I do quite like this film, I loved Danny Elfman’s music, not his best but quite good, and I enjoyed Burtons somewhat iconic visuals used within this story. Not a highly outstanding film, but as far as book to film movies go I think this is quite a good one. Romantic comedies are probably my least favourite type of film to watch next to horror. I find them predictable and boring every time and usually while watching one I feel like I have already seen it before. They seem to have fallen into some sort of repetitive rut which is why I was so surprised by this little gem. I found (500) Days of Summer quite a refreshing film and enjoyed almost everything about it. I found the pattern of the narrative refreshing, it was a somewhat circular narrative but flicked back and forth in time throughout the film. This never became confusing to watch though as a shot always appeared counting which day we were up to out of the 500. I have been a fan of Zooey Deschanel for a while now, despite the fact that she has starred in some awful films of late I always kept strong my belief in her acting ability and I feel she shines in this. I also loved seeing Chloe Moretz in her fantastic, if somewhat secondary role as the younger sister who seemed to know anything, I almost wish her scenes were longer. Some scenes here were quite fun, such as an unexpected musical number which was a nice parody of both stage and film musicals, fun as the film was though it also had many contrasting scenes that were quite sad and depressing. This balance was handled well though and I can see myself enjoying this film more times in the future.